Essentially a larger version of the FG201 micro tiller – sharing the power unit and frame but able to cope with heavier workloads. A set of four toothed rotary digging tines deliver a tilling width that can be adjusted from 25cm to 45cm. The tilling blades are fitted with side discs to avoid any collateral damage to plants or garden structures if tilling in tight situations. The FG205’s handlebars fold away to facilitate storage, while rear mounted transport wheels help move the machine between jobs. The F205's motor unit is Honda’s proven 49cc GXV50 four-stroke OHV petrol engine. This engines excellent fuel economy combined with the 0.35 litre fuel tank maximises run time. Honda’s decompression recoil mechanism ensures easy starting and restarting. It is also worth noting that the F205 can be used with a de-thatcher attachment. 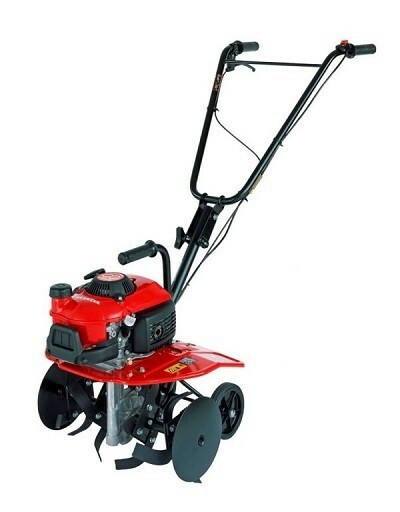 This converts the F205 into a handy lawn care tool as well as a cultivator. The Titan 740DCR is all about power and speed. The 3 cylinder 1331cc Yanmar 3TNV82 engine fitted to this machine is clearly on top of the job; the extra power allows us to fit larger wheels and achieve a transport speed of 20km/h, as well as better ground clearance for difficult conditions. This machine will comfortably drive our largest RM155H discharge on demand (DOD) cutter deck and is usually chosen when ‘all year round’ versatility is required. 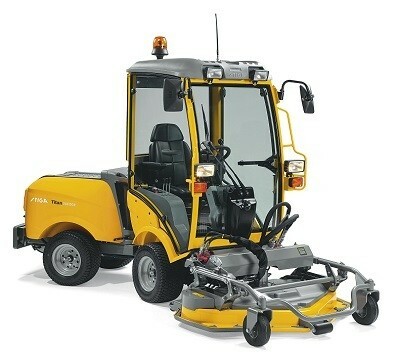 You may consider that what you are looking for is a high volume grass cutter and the Titan range will do that job effortlessly, delivering an exceptional finish with unique features that ensure less damage to the turf and surrounding obstacles, as well as improving the amount of control the operator has without leaving the seat. When you are making such a large capital investment it's reasonable to expect your asset to work for as many hours as possible throughout the year. Stiga has been making articulated implement carriers for many years and with this experience, have launched a range of machines that not only deliver excellent grass cutting performance, but allow you to benefit from a growing range of implements to make your Titan work for you all year round. Whether you are looking after a large estate, caravan park, hospital or golf course, you can be sure that the work you do continues throughout the year, even after the grass cutting has slowed down or stopped. The Stiga Titan is a uniquely versatile machine, easily adapted for snow clearing, sweeping and moving material around your site without compromising its excellent grass cutting performance. The cutter decks fitted to the Stiga Titan range will produce a perfectly clipped healthy lawn in wet and dry conditions without the need for grass collection. The chassis design incorporates permanent 4WD with an articulated steering system unique to Stiga, delivering outstanding manoeuvrability and stability in restricted and sloping areas, whilst cutting at up to 15km/h in open and flat areas. Because our unique chassis design steers from the centre point between the front and rear axles, you can be confident that any obstacle that you have passed with the cutter deck will also be passed safely by the rear of the machine. Imagine how important this is when working in caravan parks or cemeteries, or amongst expensive newly planted trees on a golf course. Stiga Titan cutter decks are very flexible too; height of cut can be adjusted from the driving seat on all models allowing you to easily adapt the machine to changing conditions. All cutter decks can be safely lifted without the need for any tools, so that they can be properly cleaned and the blades checked, and if the grass is long you can take the strain off the engine and PTO system by choosing rear discharge. The two discharge on demand (DOD) cutter decks can easily convert from mulching to rear discharge by simply operating a lever on the control console. All Stiga Titans are powered by the latest Yanmar water-cooled diesel engines. All models are Euro 2 compliant and range from the 3 cylinder Yanmar 3TNV76, to the 3 cylinder Yanmar 3TNV82 fitted to the Titan 740DCR. Each of the versatile Titan models can easily be adapted to all sorts of out of season work; no tools are required to convert this machine to a sweeper, snow clearer, grit spreader or even a front loader for moving soil or bark mulch around your site. All models have a fast transport speed (up to 20km/h on the Titan 740D) with none of the instability normally associated with driving ride-on mowers on the road. ROPS approved roll-over bars and factory fitted cabs with air conditioning are available and all models are fitted with a large 42 litre fuel tank ensuring you don’t need to re-fuel during your working day. 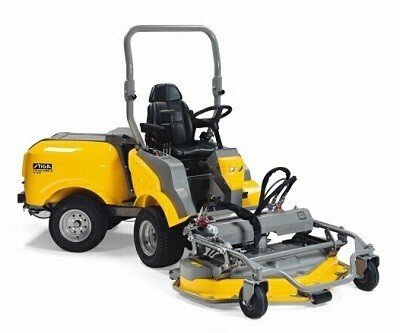 The Stiga Titan is an excellent large ride on mower. The finish that it produces rivals that of a cylinder mower without the significant maintenance costs associated with that type of machine. It's zero tail-swing manoeuvrability is unique and the ability of the cutter decks to follow extreme undulations makes it ideal for coping with the steep ridges and furrows often found on parkland and golf courses. The Titan 740D is all about power and speed. 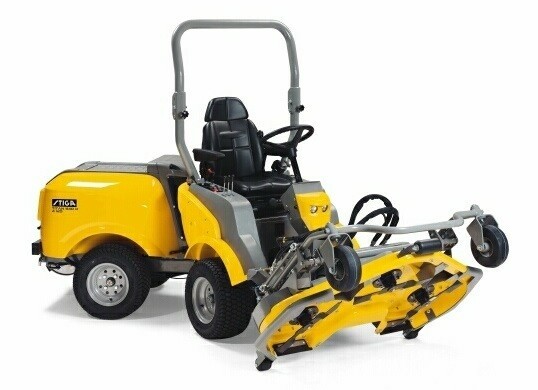 The 3 cylinder 1331cc Yanmar 3TNV82 engine fitted to this machine is clearly on top of the job; the extra power allows us to fit larger wheels and achieve a transport speed of 20km/h, as well as better ground clearance for difficult conditions. This machine will comfortably drive our largest RM155H discharge on demand (DOD) cutter deck and is usually chosen when ‘all year round’ versatility is required. When you are making such a large capital investment it's reasonable to expect your asset to work for as many hours as possible throughout the year. Stiga has been making articulated implement carriers for many years and with this experience have launched a range of machines that not only deliver excellent grass cutting performance, but allow you to benefit from a growing range of implements to make your Titan work for you all year round. An extremely manoeuvrable, robust and high performance professional ride-on lawn mower. The cutter decks fitted to the Stiga Titan range will produce a perfectly clipped healthy lawn in wet and dry conditions without the need for grass collection. The chassis design incorporates permanent 4WD with an articulated steering system unique to Stiga to deliver outstanding manoeuvrability and stability in restricted and sloping areas, whilst cutting at up to 15km/h when areas are open and flat. Stiga Titan cutter decks are very flexible too; height of cut can be adjusted from the driving seat on all models allowing you to easily adapt the machine to changing conditions. All cutter decks can be safely lifted without the need for any tools, so that they can be properly cleaned and blades checked, and if the grass is long you can take the strain off the engine and PTO system by selecting rear discharge. The three DOD (discharge on demand) cutter decks, can convert from mulching to rear discharge simply by operating a lever on the control console. All Stiga Titans are powered by the latest Yanmar water-cooled diesel engines. All models are Euro 2 compliant and range from the 3 cylinder Yanmar 3TNV76, to the 3 cylinder Yanmar 3TNV82A fitted to the Stiga Titan 740D. Each of the versatile Titan models can easily be adapted to all sorts of out of season work; no tools are required to convert this machine to a sweeper, snow clearer, grit spreader or even a front loader for moving soil or bark mulch around your site. All models have a fast transport speed (up to 20km/h on the Titan 740D) with none of the instability normally associated with driving ride on mowers on the road. ROPS approved roll-over bars and factory fitted cabs with air conditioning are available and all models are fitted with a large 40 litre fuel tank ensuring that you don’t need to re-fuel during your working day.